The tamarack tree is an oddity. It is the duck-billed platypus of the tree world, refusing to be solidly classified into any one category. Part softwood, part hardwood, and completely unique, the tamarack is a distinctive component of the northern forest. It’s useful for everyone from off-gridders to pharmaceutical companies and – not surprisingly – Native Americans made use of it, too. Tamaracks are native to North America, primarily in Canada and in the United States, from the northern Great Lakes region to the Northeast. It has more than one name, often even within in the same region. Its Latin nomenclature is Larix laricina, and it is also known as a larch — eastern, black, red or American — or a hackmatack. The word “tamarack” is said to be derived from a Native American word, but there are several theories as to the meaning, ranging from an Algonkian word meaning “snowshoe wood” to an Ojibwa word meaning “swamp tree.” Whichever origin is correct, both meanings are accurately descriptive of the tamarack tree. Tamaracks do tend to prefer cool swamps, but are not exclusive to wet areas. They do not like shade, which can keep them from taking off in dense forests, but grow very quickly in the right conditions. Excellent for reforestation and erosion prevention, stands of tamaracks are often planted in areas that have been heavily logged. The wood of tamarack trees is strong yet supple, which probably made it an excellent candidate for Native American crafts such as snowshoes. Harder and heavier than most softwood trees and even some hardwoods, the coarse-grained tamarack can be milled into lumber, planking, poles, and posts. 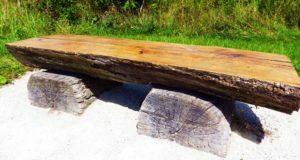 Its rot-resistant quality made it a common choice in shipbuilding, particularly the “knees,” which are large root formations that render an L-shaped piece of wood. Tamaracks have enough similarities to other softwoods — such as bearing cones and needles — that they are classified as such. They are medium-sized trees, averaging around 50 feet tall, with a slender profile. Their branches are short, stiff and horizontal. Tamaracks bear small round seed cones in spring which open in fall and remain on the tree until the following year. However, there are many distinct differences between tamaracks and typical softwoods. Before explaining how they are unlike others in the group, it might be useful to mention the basic differences between softwoods and hardwoods. Softwoods, also known as conifers or evergreens, are a classification of trees that includes species such as pine, spruce, fir, cedar and hemlock. They are differentiated from hardwoods, or deciduous trees, by their generally softer wood, their cones, and the fact that they retain their leaves — called “needles” because of their shape and texture — all year-round. A Softwood Tree … For Firewood? Tamaracks do not fit neatly into the softwood description. Not only are they hard enough to be used for lumber and building, but they are one of the few softwood species that are considered to be efficient as firewood. According to the heat classifications from online sources, tamarack is of moderate heat value, matching red maples and surpassing aspens. The most notable difference between tamaracks and other softwoods, however, is the fact that they lose their needles in the fall. They are the only native North American softwood to do so, making them a truly unique tree. Their inch-long needles grow in clusters like pine needles and look almost like tiny dust brushes. They turn from green to yellow in fall, often much later than the leaves of true deciduous trees so that they offer a last blast of lovely autumn color. But the tamarack is not just another pretty face. In addition to its uses for lumber, pulp, and firewood, tamarack is useful in traditional medicines, as an emergency edible, and as a source for resin. It also contains a chemical used in modern pharmaceuticals and an additive to foods. Truly like no other, the tamarack tree is multifaceted and useful. Industries from wood to chemicals, as well as homesteaders, backwoodsmen and practitioners of traditional arts all can gain something useful from the North American tamarack tree.